Mr. Tennis Wick is the Director of Sonoma County Permit and Resource Management Department. He will share information about USGS fault lines that may be active within our county and may pose a potential risk in our area and other associated issues, such as aquifers and preparedness. President Doug, dapper as ever, introduced Tim Delaney to lead us in the Pledge of Allegiance and Steve Marburger read us some quotes on peace by Ronald Reagan, Nelson Mandela and Albert Einstein. He finished it by referencing an article in the newspaper on the situation with immigrants in the news and peace. Today we had District Governor Erin Dunn dropping by for an unofficial visit. 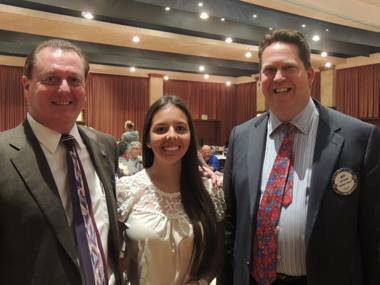 Jeff Gospe brought our new exchange student Luciana Dalmas from Santa Cruz, Bolivia. Her sister is also an exchange student…..in Nebraska! Tim Delaney brought Bev Godwin, a retired PG&E employee who is looking for something to do with his time now that he is retired. 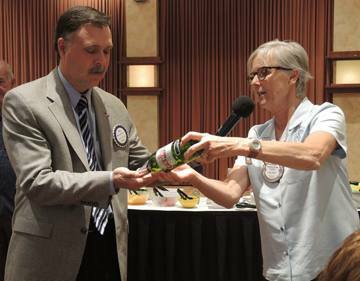 Hummm….how about joining our Rotary Club! A correction to last week’s bulletin. 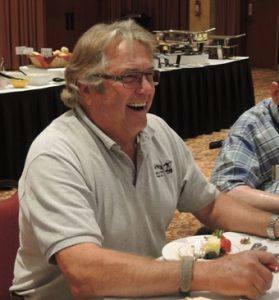 Former member Chester Dangremon’s funeral service will be this Saturday, September 12th in Oakmont. 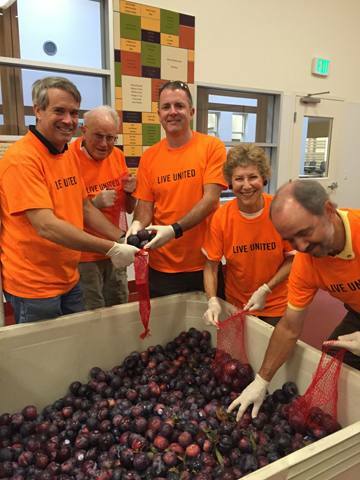 Several members of our club packed plums at the Food Bank for the United Way’s Day of Caring. Members who participated were: Matt Fannin, Diane Moresi, Robert Pierce, Casey D’Angelo, Rick Lazovick, and Bob Sorensen. Paul Hamilton announced that the tickets for the Veteran’s program will go on sale next week. The event will be on Thursday, November 5th at the Veteran’s building. Tickets will be $15 and you are encouraged to buy one for yourself and one for a veteran. This is the annual joint meeting of all Santa Rosa Rotarians and Kiwanians. We will not have our usual meeting that week. If you have not been, you really should go. It is so inspiring! Sponsorships are available for $500. Also, Oakmont is looking for Veterans to ride in their Veteran’s Day parade. Sam McMillan will have the FFA lamb and pork packaged and ready to auction off at a BBQ on September 25th! Come one and all and bid while enjoying a BBQ dinner. Our club is sponsoring the SCARC meeting on October 29th at Rosso’s. President Doug is encouraging as many people to go as possible. Jeanne Levin had gone to hear Ben Carson speak in San Francisco. She was asked a question by a reporter on the way out that made it to television! I believe Jeanne said, “He is a very nice man, but lacks political experience.” Then the reporter asked Jeanne about Planned Parenthood. Oh-oh! What this reporter did not know is that Jeanne did work for Planned Parenthood back in the day. Needless to say her response to the question did not get rebroadcast! Oh to be a fly on the wall! Any way, Jeanne donated $100 toward the John Brown Memorial Scholarship. She was quickly matched by Bill Hatcher, Fred Levin, Steve Olson, Ted Wilmsen, Sam McMillan, Craig Meltzner, Vickie Hardcastle, Debi Zaft, Doug Johnson, Joy Parker, Judy Glenn, Peggy Soberanis, and Larry Miyano. All total $1705 was collected for the scholarship and then doubled by a matching grant from the foundation! Please note that the annual John Brown birthday party will be next Wednesday September 16th at Fred and Jeanne Levin’s home. Generous Robby Fouts provides winning bid for the print. As you know, we have had a picture up for auction for the past several weeks. Today was the final day to bid and Robby Fouts outbid Eileen Carlisle for the picture at $305. First of all Sam McMillan bought 24 squares! He won 3 prizes! Diane Moresi and Mark Burchill each won 2. Other winners were Marnie Goldschlag, Cecil Humes, Jack Abercrombie, Bart Eddy, and Craig Meltzner. However the big winner of the instant Paul Harris Raffle was Karen Ball! Nearly 90% of the world’s polio cases last year occurred in Pakistan. But the country is making dramatic progress. What percent are polio cases year to date compared with 2014? Carl Campbell, Kerrie Chambers, Cecil Humes, Ryan Thomas, Doug Chase, Steve Dunn, Bart Eddy, and Jackie McMillan are all celebrating birthdays this month. Emily is married to Kevin and has two sons, Conor and Brady. She was born and raised in Sebastopol. A graduate of Ursuline and the University of Santa Barbara. Right out of college she was hired by Bank of America in corporate risk and compliance in Charlotte, NC. From that she went to a consulting firm in Texas and was traveling all the time. She got married and Conor was born before the traveling became too much. 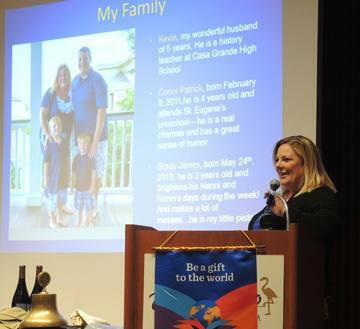 The family settled back in Sonoma County and she took a job at Summit State Bank as a business development officer. Emily is very involved with several nonprofits and has agreed to be the Giro Bello Sponsor Chair next year! Norm Owen donated$100 to the Larry Bello fund……Roy and Bruni Thylin just celebrated their 50th wedding anniversary and a trip to Nebraska and donated $50 to the club, $50 to the John Brown Scholarship and $50 to Polio Plus. Jack Geary has given his notice that he will be giving up the position of Sergeant-At-Arms at the end of this fiscal year. If anyone is interested in the position, please let President Doug or a board member know. Jeff Kolin was a member of our club from 2001 to 2010 when he had to leave to take the City Manager’s position for the City of Beverly Hills. 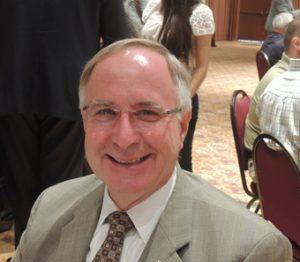 He is now back, and retired, from some 38 years in city government. We were quite impressed when he left us for Beverly Hills. He had a few comparisons; we meet at the Flamingo Hotel and pay $22 for our lunch. In Beverly Hills they meet at the Beverly Hills Hotel and spend $40 for lunch. Santa Rosa was founded in 1868 and Beverly Hills in 1914. The Beverly Hills Hotel was built out in the middle of nowhere in 1912. There were no roads; you had to take the railroad to get there. Rodeo Drive is the street from the railway station to the hotel. Celebrities got discounts to build there and before you know it, the Glamour Era of Beverly Hills was born and the town took off. 62% of Beverly Hills is multi-family compared to 49% of Santa Rosa. Beverly Hills has about 30,900 residents, but it swells to 200,000 or more during the week with those who work there. Santa Rosa has about 175,000. Lots of movies and TV are filmed in both towns. Beverly Hills is not afraid of charging fees and taxes to its citizens. In fact they are very willing to pay. Throughout this last recession the city of Beverly Hills always had a surplus in the general budget. Beverly Hills takes advantage of downturns in the economy to build. Consequently the City of Beverly Hills owns a lot of property; the largest landowner in the city. Charitable giving is the norm. There are lots of charity balls and events raising all kinds of money for various causes. One of the questions they asked Jeff during his interview, “Do you own a tux?” He now has two. The meeting was a delight to all who attended and Chairman Boyd put some “pep” into the assemblage by having an old fashioned roll call, compelling each man to tell whether he was a native son, and if he did not happen to be a native son, to explain why he came to California. The reasons given for the latter were numerous and varied. The native sons were compelled to stand and sing “I Love You, California,” and then the “foreigners”, those born elsewhere, were obliged to sing the grand old song. Which led Rev. Elmer Ingram to remark that the native sonce should not be ashamed that they could not sing it better, and the “foreigners” should be deported for the manner in which the warbled the melody. Aside from the natives present, Illinois had the greatest gathering at the Rotary luncheon. Three were born in the Sucker State. The Santa Rosarian will be continued in the same format as used since the DG visit. Republican newspaper has a pending ownership change. Tom Monsen from the newspaper was proposed for membership. A member sold his business, and was being considered for membership termination, but the Board agreed to delay until he engaged in a new business. Membership will be divided into six groups to stimulate attendance.